Photo courtesy of Jay Town at the Herald Sun. Just like their famous counterparts, these two know a thing or two about adventure. Earlier this month, two 18-month-old cats were found dumped outside The Lost Dogs’ Home Cranbourne shelter. 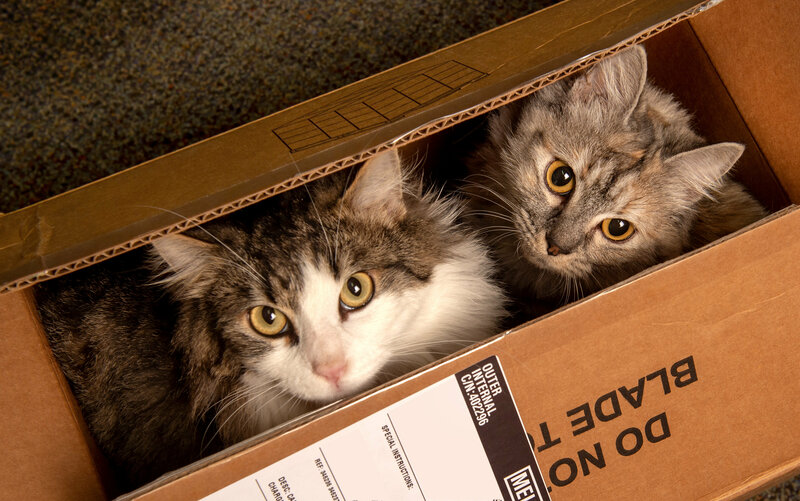 In a box sealed with tape, with the exceptions of two smallish holes, the cats became very hot and were at risk of overheating. “The box was taped up – most of the air holes had tape over them. We were lucky to get to them in time, the cats were really hot,” says Sally Laity, Acting Shelter Manager at The Lost Dogs’ Home’s Cranbourne shelter. They were taken immediately to the on-site veterinarian for a full health check. Fortunately, while the cats were very hot, they had not suffered any lasting damage to their health. The two cats, named Diego and Dora, are quite the explorers! During their stay at the Cranbourne shelter they were often found jumping on ledges, sitting on computer keyboards, and welcoming new animals to the shelter. They are so friendly. They played with the kittens coming through the vet surgery, and even with the veterinarian’s staffy Wilma when she brought her in! After enjoying some well-deserved relaxation and recovery, Dora (animal ID 1045243) and Diego (animal ID 1045242) were brought North Melbourne adoption centre this week to find themselves a forever home. The Home believes the two adventurous felines are most likely littermates and would really like for them to be adopted together. Amanda Smith, Cattery Coordinator at The Lost Dogs’ Home’s North Melbourne shelter is hoping they find their forever home together as soon as possible. The Home’s Clear the Shelter campaign is on until 10 June 2018. All cats and kittens are desexed, microchipped, vaccinated**, and up to date with flea and worming treatments – which is all included in the reduced $25 adoption fee. The Home’s standard adoption process applies, ensuring all pets are matched with suitable homes. **due to age, kittens will require follow up vaccinations at your local vet.